Procrastination can be a deadly habit and it is so easy to slip into, especially for small business owners and partnerships. The lack of an immediate need or pressure to address brewing and potential future legal problems means that all of the impetus for action must come from business owners themselves. So, rather than procrastinate, here are a few tips to get a jump-start for 2016. 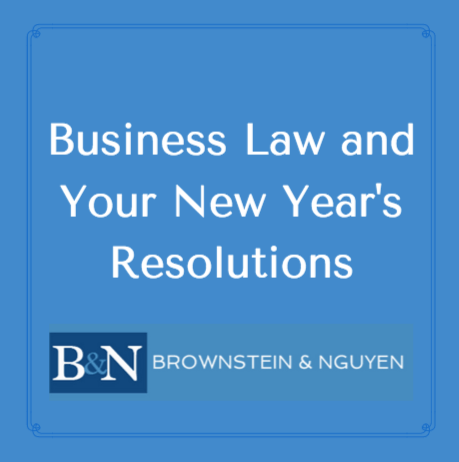 For your New Years’ business resolution, be proactive and anticipate legal problems both within and without your business. Proactively confront personality clashes among your partners. Be honest about the differences in management style, business goals, and financial philosophies. A partnership is best run by a balance of personalities, not by the dominance of one. If your business involves customer data, take a hard look at cyber-security. It seems like 2015 was the year of the data breach, from BlueCross/BlueShield to Ashley Madison to the U.S. Office of Personnel Management, data breaches were everywhere. Educate employees on proper email, internet and cloud storage usage and security measures. The last thing your business needs is the economic loss of a data breach and inevitable lawsuits that follow. If your business is open to the public (restaurant, retail store, etc. ), another issue to consider is investing in an ADA-compliant infrastructure. Disability compliance lawsuits are one of the easiest to avoid. Also, don’t forget to invest in your digital and other intellectual properties. Aside from these and other business issues that can result in costly legal issues, one of the most important and often-overlooked traps for business owners is failing to plan for potential break-ups. If you do not already have one, come up with a “business divorce” plan. No one likes to think about it, but partnerships do fall apart. It is far cheaper and more efficient if rights and obligations of shareholders and business partners are established before an event of dissolution. Don’t just consider capital contributions, assets and liabilities: take note of clients; employees and personnel matters; technology, trade secrets and other intellectual property; goodwill; and business continuation. Many businesses fail because of a dispute among partners that might have been prevented or at least mitigated with proper planning. Make 2016 the year you build a sturdier foundation for your company for the future. A key element of proactively running a business of any size is having experienced legal counsel available. Contact Atlanta business law attorney Jay Brownstein at Brownstein & Nguyen for sound, practical business advice and legal representation.